Part 3 of Peacock Tail Bag crochet along marks the half-way point and our bag is really starting to take shape now. 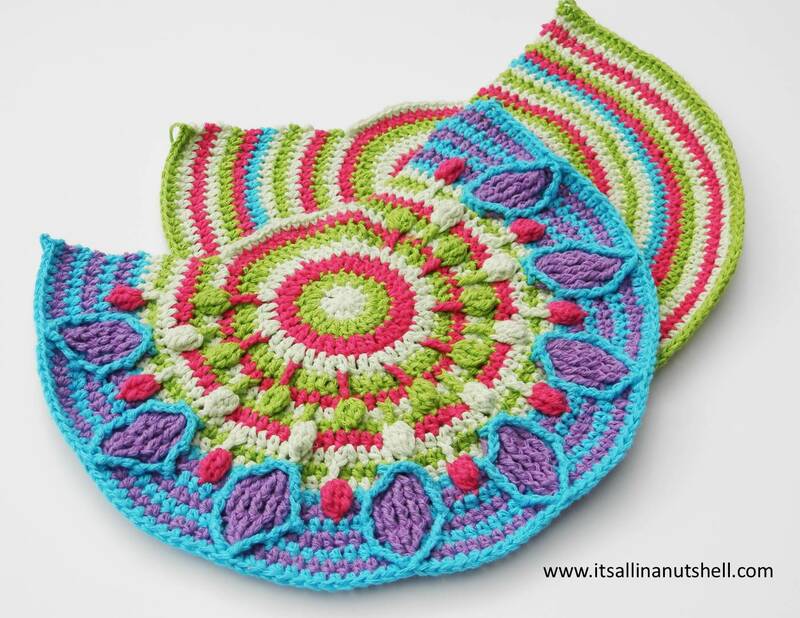 Peacock Tail Bag is designed by Tatsiana from Lilla Bjorn Crochet. On Tatsiana’s blog you can find the original US pattern and many translations. Also for this part I have split the front and back parts into two videos and added markers to the description of the videos on YouTube so that you can easily jump to a specific round if you want to. You can find the video links for the front and back of the bag on my dedicated page here on my blog or on my YouTube channel. I am using Linen Soft in the following colors: 614 as that is my main color in addition to 622, 625, 626 and 627. I have used my colors for part 1 in the following way. *For row 14 on the front part of the bag I have used two colors. I wanted the bobbles to be a different color to the eye of the peacock tail. I carried the two colors at the same time and changed from purple to pink on the last pull-through of the stitch preceding the cluster. I changed back to purple with the last yarn-over of the cluster. This two-colorway is not shown in the video; in the video I use only one color for row 14. I frogged part 3 after making it because the colors were just not working for me. With the bobbles in pink I am happy with the look. It was just all too much purple otherwise. To join the CAL, join the Official CCC Social Group on Facebook that is hosting the project. To make this bag you will need 6 balls of Scheepjes Linen Soft yarn in 5 colors; for the main color of the bag you will need 2 balls and of the other 4 colors you will need 1 ball of each. There are two kits available that contain everything you need to make your bag; one in a Peacock colorway and the other in a Pastel colorway. Linen Soft is available from Wool Warehouse (UK/International), Paradise Fibers (US/CA) or your local Scheepjes stockist. I am using Linen Soft in the following colors: 2 balls of 614 as that is my main color, and 1 ball each of 622, 625, 626 and 627. In addition to the yarn you will need a bag handle, 2 30mm D-rings, an 18mm magnetic clasp, interfacing and fabric for the lining. Next week we continue with our bag. Hope to see you then.